Espoo, Finland - Nokia, a global leader in creating the technologies that connect the world, together with its world-renowned industrial research and innovation engine, Nokia Bell Labs, was today announced as Technology Partner to UK-based sailing team Alex Thomson Racing. The groundbreaking new partnership, which continues through to 2021, will see Nokia Bell Labs join forces with skipper Alex Thomson and his team, as he looks to become the first British sailor ever to win the iconic Vendée Globe race. One of the toughest sporting challenges in the world, the Vendée Globe is a 24,000-mile solo, non-stop unassisted race around the world. The challenge sees skippers battle through vast, unpredictable waters and brutal conditions, with winds up to 70 mph (113 kmh) and mountainous waves. When the race reaches the depths of the Southern Ocean and skippers pass Point Nemo, they find themselves closer to the International Space Station than any being on earth, making communications capabilities crucial and emergency rescue virtually impossible. For sailors like Thomson, the Vendée Globe represents the ultimate physical and psychological challenge. In the last edition of the race the British sailor slept no more than one hour at a time over the course of 74 days, 19 hours and 35 minutes, single-handedly fulfilling the roles of skipper, navigator, meteorologist, engineer and medic. Through the partnership announced today, exceptional minds from Nokia will explore onboard and shore-based technologies and systems in a bid to enhance the performance capabilities of the sailing team. In doing so, the project will align with Nokia's ongoing focus to push technology limits to support mission-critical networks in the 5G era. Nokia Bell Labs will work alongside Thomson - and his IMOCA 60 race boat - to develop and test both existing and new cutting-edge technologies. From augmented intelligence and wearable technology through to networks and communications capabilities, the partnership will seek to discover and create the technology of tomorrow. Nokia Chief Technology Officer and Bell Labs President, Marcus Weldon, said: "We are delighted to be working with Alex Thomson Racing to push the limits of what is possible, and pioneer breakthroughs in the seamless integration of human talent and technological performance, in extremely harsh and often remote environments, in a race against time. 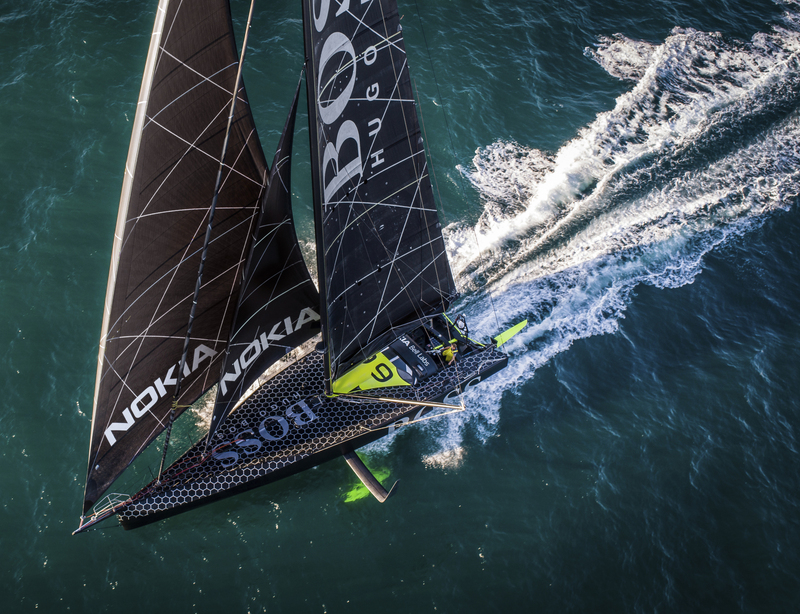 The partnership will see Alex Thomson Racing's current boat, HUGO BOSS - which the skipper raced to a second-place, record-breaking finish in the 2016-2017 Vendée Globe - feature the iconic Nokia brand. When the team's new multi-million-pound race boat is unveiled in June next year, meanwhile, the Nokia brand will continue to sit alongside that of the team's long-standing headline partner, HUGO BOSS. Stewart Hosford, CEO of Alex Thomson Racing, said: "As a team, we pride ourselves on being true innovators and one of the most ambitious, forward-thinking teams in the sport of sailing. It was clear from the moment we met Nokia Bell Labs that ambition and innovation are also at the heart of everything they do and so we could not have found a partner more suited to us. "Technology, analytics and data are now more crucial to our performance than ever before. Today's IMOCA boats are some of the most technically advanced machines in the world of sport. This is evidenced by the Volvo Ocean Race's decision to move into foiling monohulls under the IMOCA class, another exciting step forward for our sport. This is therefore the perfect time for Nokia to enter this space, and to explore the wealth of opportunities that exist for research and development. "I have no doubt that this partnership will take Alex Thomson Racing into the cutting edge of the technology space and provide a whole new level of performance for our team, as we look to make history in 2021." Nokia Bell Labs is the world renowned industrial research arm of Nokia. Over its 92-year history, Bell Labs has invented many of the foundational technologies that underpin information and communications networks and all digital devices and systems. This research has resulted in 8 Nobel Prizes, three Turing Awards, three Japan Prizes, a plethora of National Medals of Science and Engineering, as well as an Oscar, two Grammy awards and an Emmy award for technical innovation. For more information, visit www.bell-labs.com. Alex Thomson is the youngest skipper ever to win a round-the-world yacht race. When he triumphed in the 1998/1999 Clipper Round-the-World Race he set a record which still stands today. Thomson also holds the British solo, unassisted round-the-world monohull record, which he set in 2017 when he finished the grueling Vendée Globe race - 'the Everest of sailing' - in just 74 days, 19 hours, 35 minutes. Having achieved third and second place finishes in the last two editions of the iconic race, Thomson and his team - together with their long-standing sponsor, HUGO BOSS - now have their sights firmly set on becoming the first British team in history to win the race in 2020/2021.